Can you trust your contractor? Here are 6 key elements to consider when hiring a contractor for your project. Feel confident in your decision! Remodeling projects are often exciting! But when it comes to the contractor managing the project, it can mean the difference between confidence and sleepless nights. So how do you choose the right contractor and prevent those sleepless nights? Here are a few important areas to focus on when interviewing prospective contractors. How much experience does the contractor have with your type of project? Many contractors try to do all forms of construction, but there are subtle differences in materials and design that affect the outcome of each construction project. For example, Archadeck specializes in outdoor living spaces. Could we remodel a kitchen? Absolutely, but you might find there are several little things that just don’t look quite right. Choose a contractor who specializes in your type of project. A good rule of thumb is if a company has done at least 100 projects in a category, they have probably learned the nuances that make sure the project is done right. What is their background and history? Looking a contractor up on Angie’s List and The Better Business Bureau is a great way to learn how the contractor treats other clients. Speak with references and, if possible, take a look at other projects the contractor has completed. A contractor that does not have a long list of references prepared may be a red flag. Pay attention to the little indicators as you interact with the contractor. If you notice they are not meeting your standards before you sign a contract, they will most certainly fall short during the project. How quickly do they respond and what is the quality of their response? Do they ask questions to help you avoid mistakes? Do they listen and understand the priorities for your project? Do they commit to follow-up, and more importantly, do they fulfill these commitments? Clear and written details. Project specifications should include details regarding materials and finishing information. Any items the client will be responsible for should also be included. For example, we note number one grade decking and stainless steel screws for our deck projects. Or when we build screen porches, we note that the client buys the ceiling fan which we install. Design plans. In many cases, it is helpful to visualize your project. With every project we build, we offer a plan view (view from above). This helps ensure Archadeck and clients are in full agreement with what the end result should be. Price or estimate? Some contractors give estimates. Estimates can change and some contractors purposefully give a low estimate that they plan to increase once the project begins. We guarantee that the price we agree to will not change unless the project is changed by the client or something unforeseen (not visually present or a requirement by a building department outside of noted building codes) occurs. Project management is crucial in construction. Understanding how a contractor manages the multiple issues that can arise during the course of the job should be important in deciding who you want to hire for your project. What system does the contractor have in place to ensure your project runs smoothly? At Archadeck, we have a system called the Job Progress Methodology. This is an elaborate checklist with over four supporting guides for the field personnel that keep us on track. We use this tool in conjunction with a series of construction standards that clearly reflects how each detail of the project will be built. Who are the crews and how are they managed? We work hard to find skilled, reliable, and trustworthy tradesmen. We issue a written test, conduct background checks, follow up with references, check that all insurances are up to date, and that our crews are properly licensed. With new crews, our Construction Manager is on site daily for the first two to three weeks to ensure they are building to our expectations. Does the contractor handle permitting and inspections? If you want a full service contractor, they should handle all issues related to the permits and inspections required for your project. This includes contacting JULIE (Illinois utility locator service) and providing any drawings and information your Home Owners Association might require. Do they keep their clients informed of the job progress? Some of the feedback we often hear from our clients is how much they appreciate our daily communication and updates about the progress of their project. It is helpful to understand what’s been done, what is planned, and if there are any problems that need to be or were addressed. This grants peace of mind that every detail is being handled and allows for less disruption in our clients day to day lives. It is important to understand what the contractor has in place to protect you and your home. The safeguards they have in place and the manner in which they respond to these questions help indicate how trustworthy a contractor may or may not be. Liability insurance is a must. This protects your home from any damage caused during the construction process. Workers’ Compensation is also important and required for any company with employees. This protects you from an employee of the contractor getting injured on the job and suing you for the bills. Contractors should be licensed in the town or city the construction is being performed. Request a copy of their insurances and applicable licenses. What type of warranty do they offer? We offer a warranty of one year on workmanship and five years on structural issues. For added protection, we also offer a third-party guarantee of performance and warranty coverage. Archadeck clients receive a National Guarantee Corporation Warranty. This insures their project is completed and they receive at least two years of warranty coverage. Will the contractor stand behind their work? All too often we hear about contractors or companies that hide behind a clause in their warranty. A good contractor will stand behind their work and do the right thing, regardless of the warranty terms. What do your research and instincts tell you about the contractor or company? Can you trust them to do what they say, to stand behind their work, and to do what is right? After interviewing with your contractor, you should feel comfortable in your decision, knowing they are experienced, insured, organized, and ethical. Rain or shine, cold or warm, we at Archadeck enjoy helping you create the outdoor living space of your dreams. Whether it’s a patio, deck, pergola, or even fun ideas for the great outdoors; we want to help you create the perfect backyard experience. With Christmas right around the corner, here are a few gift ideas any outdoor living lover will enjoy using all year round! We hope you enjoyed your summer! The days are definitely growing cooler and winter is right around the corner. Now is the perfect time to start thinking about preparing your outdoor living space for winter months; you’ll want to maintain your wooden deck, outdoor furniture, and paver patio to extend their life. Here are a few tips to get you started. Sweep the surface removing all leaves and debris to help prevent mold and mildew forming. Wash with mild soap and water. If some dirt remains or if there are signs of mold, you may need to pressure wash the surfaces. It is advisable that you use a professional as pressure washing at too high of a setting may cause damage. If you have a deck, inspect the entire deck (slats, handrails, railings, and posts) noting any rotting, loose rails, or warping. If re-hammering the nails or tightening screws causes the nails or screws to sink into soft wood or splits the wood, then the piece should be replaced. If you have a patio, add joining sand and sweep evenly into the joints of your patio. Don’t put too much sand on the patio at one time. Most paver patios have tight joints between bricks and won’t need a lot of sand. Wash and store vinyl furniture indoors. Inspect any wood furniture for damage and make the necessary repairs before covering or storing it for winter. Cover with a heavy tarp or store inside a shed or garage to protect it from the elements. Clean soil from planters. Any pots made of clay or other fragile materials should be brought indoors. If you are shoveling snow from your deck, run the shovel lengthwise across the boards to minimize scratching or cutting into the wood. Another option is to use a plastic shovel. Avoid salt and other ice melting substances as they may damage or discolor your deck finish. Herbs are great for creating fresh, tasty recipes and add a beautiful touch to your outdoor living space. Here are 10 easy tips for growing your own herb garden so you can get started today! The weather is finally warming up here in the Chicago suburbs, and with it, outdoor living ideas are blooming. Have you considered planting your very own herb garden? Herbs are great for creating fresh and tasty recipes, home remedies, and much more. They also add a beautiful touch to your outdoor living space, whether they’re planted in a garden or pots around your patio or deck. So how do you get started? 1. Just do it! Growing your own herbs is cheaper than purchasing fresh herbs from the grocery store. The convenience of having fresh herbs on hand for your meals and the gratification of spending some time outdoors in the sun growing your garden is invaluable. 2. Pick a sunny spot with good drainage. You will find most basic herbs love the sun and don’t like being too wet. Only a few ( like cilantro, lemon balm, and mint) like partial shade. If you want to plant in a container, you can plant each herb separately or put them all together in one big bowl. You can also plant them in pots according to the recipes you like to use them for, a Tai pot, an Italian pot, a chicken dinner pot. Use a soil-less potting mix that will drain well. 3. Speaking of mint… Mint will take over all the other herbs and take over your whole yard if you let it. Plant it alone in its own pot. 5. Pick a spot near the kitchen. This allows you to step right outside and snip off a sprig without having to trek through your yard. 6. Plant some perennials. Try sage, thyme, lemon thyme, chives, oregano, fennel, marjoram, and mint. 7. Try a few annuals. Big-leafed sweet basil or Genovese basil are great all-purpose basils that make for easy growing. Plant them when it’s hot outside when you plant your tomatoes. Dill or lemon balm are some other good annuals to try. 8. Don’t over water or over fertilize. Water every few days when the top few centimeters of soil is dry. Over fertilizing will cause the plants to produce too much foliage and they won’t have the intense flavor that a good herb should have. Once a month is usually enough. 9. Harvest often. Harvesting promotes growth and keeps plants in their growing. Stop by your garden before dinner each night and snip away. You can harvest up to a third of the foliage. If you see a flower, clip or pinch it off. Once a herb flowers it is trying to finish its life cycle. 10. Eat and enjoy! If your recipe calls for dried herbs, double or triple the amount instructed with fresh herbs. They are not as concentrated as dried herbs. Freeze any that you can’t use right away. They’ll make delicious soups when the weather turns chilly again. Spring is here and it’s time to break out your patio furniture. Here are a few tips on how to prepare your outdoor furniture for spring. Spring is just around the corner. Soon the weather will turn warm, flowers will push up out of the ground, the grass will be green again, and the invigorating fresh scent of the outdoors coming alive will drift through your windows. Are you ready? Author Archadeck of ChicagolandPosted on March 15, 2013 Categories Outdoor Living Chicagoland, TipsTags Archadeck, chicagoland, decks, outdoor living, redecks, Spring PreparationLeave a comment on Think Spring! It’s February, and Spring is just around the corner. Your grill, sitting unused on your deck or patio, is calling to you. The smell of grilled savory meat and vegetables seems a distant memory. You want a barbecue – real barbecue. What’s stopping you? Summer may be the traditional season for grilling, but there is no reason you can’t continue to make use of your grill and outdoor living space during the winter. 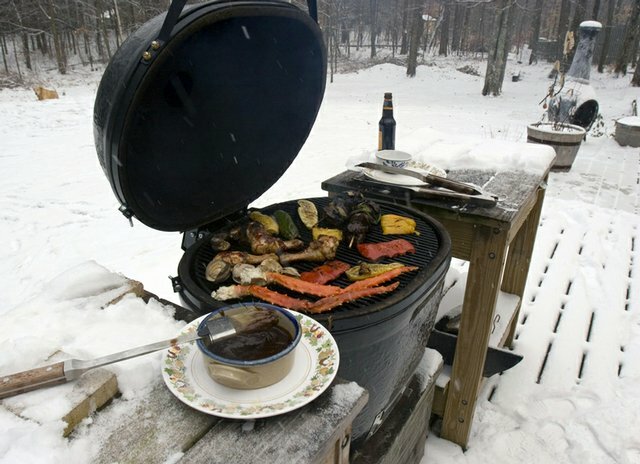 With just a few tips, your winter grilling can be a success. Check out this article, it gives great suggestions on how to keep you safe and your food delicious.